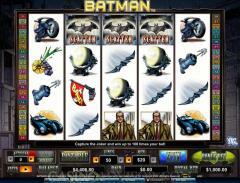 Batman is a branded Cryptologic slot game released in agreement with DC Comics. It features the popular super hero Batman. 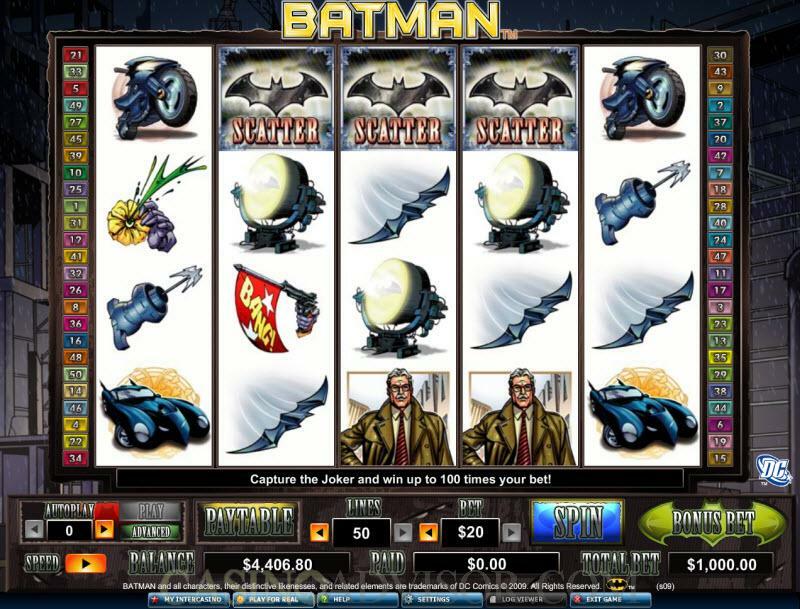 The slot game begins with an animated clip of Batman chasing the Joker in Gotham City. The symbols on the reels will delight the Batman fan. The wild symbol is Batman himself and the scatter symbol is the Batman Logo. Other symbols are the Joker, Commissioner Gordon, Batmobile, Batcycle, Batsignal, Bang Flag, Acid Flower, Batwing, Harpoon Gun and Joker Card. The symbols are crafted in a caricature style. 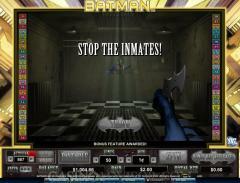 Batman plays with one coin wagered per payline activated. Players can activate up to 50 paylines. There are four rows of symbols on the reels. The coin size range starts from 0.01 and goes up to 20.00. Batman is the wild symbol. It appears only on reels 2, 3 and 4. It usually appears as stacked wilds, sometimes on all four rows of the reel. The Batman Logo is the scatter symbol. It offers scatter payouts when two or more symbols appear aligned left to right. The Batman re-spins feature is triggered when Commissioner Gordon appears on reel 1 and Batsignal appears on reel 5, or the other way around. First the existing winning combinations are paid. Then reels 2, 3, and 4 go blank and the Batsignal comes to rest on one of them. That reel will have expanding wilds for the re-spins. This reel will be held and the other reels will spin three times. All payouts during the re-spins are doubled. This feature can be retriggered. Batman offers an innovative Bonus Bet feature. It not only activates all 50 paylines but wagers an additional 10 coins making the total bet 60 coins. However it offers the players certain advantages in return. An additional Batman wild symbol is added to reels 2, 3 and 4 at random. The scatter payouts are multiplied by 50 and the line bet. The main advantage is that the Descent into Madness feature is unlocked by the Bonus Bet. This feature is not otherwise available. Another condition for this feature to be triggered is that there should be at least three scatter symbols aligned from left to right. 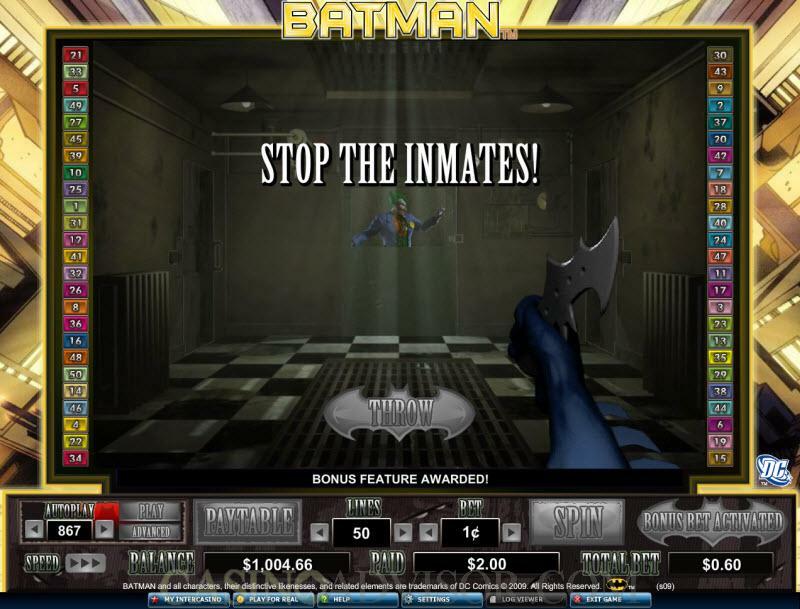 In this game, Batman first defeats inmates in order to win bonus credits. He then goes after the Joker. If he traps the Joker the player can win up to 100 times the triggering bet, otherwise the player gets a consolation prize. Interested in reading more detailed information about Batman? If so Click Here for more details.